When did you last stand in line? I mean really stand in line. It might have been the airport (average line time perhaps 15 minutes), the drug store, even in busy Manhattan, a minute or two before customers start tsking and wishing the person holding them up at the counter would just self immolate already, or wish they didn’t try to pay with expired Canadian food stamp checks. Our convenience society and technology has almost eliminated the tiresome, dull chore of queuing. It has trained us, particularly the young, to not have any patience for waiting. As “convenient” as that might be, psychologically it has bred a generation who can’t wait. Its almost perceived as an assault on us to line up. Voting facilities aren’t “efficient”. You can’t order up a ballot via your cellphone ahead of time, can’t have it delivered (except in Oregon with their all-postal voting, or postal vote in some other states like NY): it all moves slowly. The check-in is manned by flustered folks, often unpaid volunteers perhaps unfamiliar with the rolls or ID requirements. Voting is not set up like Starbucks or CVS, unfortunately, and it might be the longest line millennials have ever stood in. Here’s a big problem, a BIG problem if you’re on the left: “kids” don’t vote. If more millennials voted, with their tattoos and ironic haircuts the Republicans would be out of business forever. Its that simple. Its a sobering, terrifying read. The older white Fox News demographic vote: they stop off at the voting center before the Country Kitchen Golden Corral buffet’s Early Bird Special. Republican oldies squeeze themselves out of their Jesus-stickered old Cadillacs and lumber on in to the voting booth. And that’s why they win. They have the numbers and in democracies the numbers win. They win big: the presidency, thus the Supreme Court (see last week), state houses, congressional and senate seats, gubernatorial races and dog catchers if they had to run for office. All because they turn up and don’t mind waiting: curious considering they have less time left than we do, but that’s the Greatest Generation for you. There’ll always be a disconnect between older voters, who have lived long enough to see that voting actually matters, as opposed to the “Meh, it’ll happen without me whether I vote or not, there’s a long line, etc” youngsters. This is a “generational dissonance” untethered to our current reality, but it effects our current reality. While our system and representative government is bent out of shape by money politics its results are even more perverted by the difference between rates of youngsters vs. oldies voting. It is our civic duty. In a better America we’d have the kind of compulsory voting Australia instituted early last century. The small ($20) fine for not voting is enough to nudge most Australian citizens to the polls. Aussies don’t even have to vote but they have to turn up at the polls and get their name checked off. Interestingly, and happily, compulsory voting is a trend that’s catching on around the world. From only a few countries in 1990, now 5% of all UN member states have instituted it to some degree; most of South America, Belgium, South Korea, and Congo to name a few. The US is behind Congo in getting people to the polls. Because if its unpleasant, but important, like military service, paying tax, vaccinations, organ donation or jury duty, sometimes the population does need a nudge. The optional voting we have now is an example of what social psychologists call a “collective action problem” which humans excel in messing up: the ultimate “free rider” nightmare. It also results in the most extreme elements voting: middle-of-the-roaders, not so lit up by political issues, are more likely to skip it. And we complain about politicians only catering to the extreme ends of the spectrum! 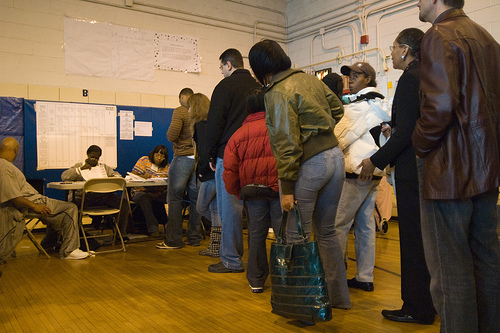 Republicans will oppose compulsory voting like crazy – it would be the hill they’d be willing to die on given their admitted active disenfranchisement efforts of the poor and minorities. (See the pages of this periodical to see evidence of this morally bankrupt disenfranchisement effort). Or, failing compulsory voting, let’s do what the kids do well: use a millennial technological fix. There’s internet or ATM voting: we already trust banks, credit card companies and the SWIFT system with all our money. Why not our votes? There’s also an equally efficient fix to this standing in line problem available today: postal votes. Oregon only has postal-only voting and in states like New York, one can (theoretically) only vote postal in certain circumstances. But those circumstances are based on personal judgement, so really anybody can do it and get the whole process out of the way weeks ahead of time. It requires a bit of forward planning to order one’s ballots a couple of weeks early (like….now) to order your postal ballot, but the price of the stamp is worth one’s time. And you don’t even have to stand in line (horrors!) at the USPO, you can download stamps. So kids and fellow Gen Xers…. for your future…..try out the Zen of standing in line. While doing so you can play with your i-phones, show off your ink, and maybe meet a cutie on-the-line as opposed to online. David Anderson is an Australian-American attorney in New York City who writes on politics, the law and psychology for a variety of publications.